Make your quinceanera stress-free by following our simple list of "Do's and Don'ts"
Your quinceanera will be one of the most memorable events in your life. Family, friends and all those who are dear to you will be around to share that special day. You want it to be perfect and you want to enjoy every second of it. Print out a quinceanera planning checklist. The more you prepare and stay organized, the less stressed you’ll be throughout the planning process. Decide on your theme.Everything else will be based on your theme, including the look that you want from your Orange County makeup artist and Orange County hair stylist. Make a guest list before you book a venue for the party. The number of people attending is important in choosing the venue. Everyone should feel comfortable and not crowded so that they can enjoy your party! Make a budget and stick to it. A lavish party is great, but you can still have a fabulous one without spending too much. Hire an event planner even if it’s only for the day of the party. Your mom and relatives are willing to help you, but they also deserve to enjoy and relax during the party. When everybody is relaxed, your party will be more enjoyable. Take care of your guests. Even though you’re the star of the party, your guests should be made to feel comfortable and welcome. Decide on your music at least a month before the party. Music is important because it sets the tone for the whole party. You can ask the band or the DJ to help you choose the songs for your dances, as they have experience in quinces and parties. Don’t bring too many people when looking for your dress. Fewer people will make deciding less confusing and more enjoyable. Don’t delay making the seating charts. The earlier you accomplish things before the party, the more successful it will be. Don’t stress about little things. Delegate some tasks and decisions. Controlling every little thing will leave you exhausted. 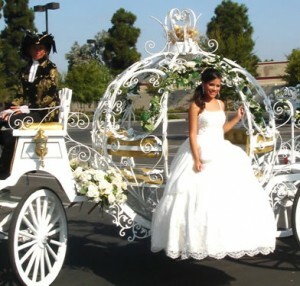 These are just some of the things that can help you have a wonderful time in your quinceanera. The most important thing to remember is not to worry about little stuff and focus on having a good time. If you enjoy your quinceanera, everybody will also have fun. Visit our Quinceanera Planning Checklist page for even more tips on organizing a quinceanera! Don’t Forget! Our hair and makeup professional work in all areas of Orange County, Palm Desert, Riverside and Palm Springs and are available for free consultation appointments!